Thanks to travel, tourism and immigration, interest in Asian cuisines has grown rapidly in the US and other Western countries in recent years. Foods of India, China, Japan, Thailand and Vietnam are the most familiar, but Korean cuisine is building in popularity. The recent summit between Donald Trump and Kim Jong Un, in Singapore, put Korean food in the international spotlight. An acquaintance, a Korean woman who has lived in the US for many years. I'll call her HJ. A couple who lived in Seoul, South Korea for 2 years for a work assignment. I'll call them Ron and Linda (not their real names). I sent Ron and Linda a list of questions about their experiences arriving in Korea and learning about the food. I had plenty of questions for HJ as well, but she decided the best way to learn about Korean food was to go to a Korean restaurant. So a group of us went to a popular Korean restaurant for lunch recently. More about that later. While there are many similarities, Korean cuisine has some distinctive differences. Korean food is characterized by seasonings like gochujang, the popular red chili garlic sauce, and kimchi. As Ron and Linda observed, kimchi is everywhere, at every meal. What exactly is it? Saying "kimchi" (or kimchee) is sort of like saying salsa. There's a basic concept - seasoned fermented vegetables - but there are endless variations, depending on what vegetables you use and what other seasonings you add. A common variety is made with cabbage and spicy seasonings. This style can have a very strong fermented/garlicky flavor that takes getting used to. But there are other milder variations. For example, at our group lunch, we were served cucumber kimchi, which was more like fresh pickles. And, as with salsa, kimchi is used in small amounts, more as a condiment. You don't chow down on a bowl of kimchi, but it can be added to other dishes like soup or Korean pancakes as a flavoring ingredient. "I think it is safe to say that we felt differently about it when we left from when we arrived. It was a difficult taste to acquire. Also, there is a wide variance in quality and type...and yes, it is as ubiquitous as everyone says. The smell alone can be a bit much...and it is EVERYWHERE." A glance at any Korean cookbook, menu or food website reveals an emphasis on vegetables. Ron and Linda agree. They describe an infinite variety of vegetables in grocery stores, many unidentifiable. Foraging for wild vegetables is a popular activity, even in cities, where open spaces and hiking trails encourage outdoor activity. Consider gosari, or fernbrake (or fiddlehead ferns). Gosari is a standard ingredient in the very popular dish bibimbap, and is also served as a side vegetable. It's foraged in spring when the ferns are young and green. The fresh-picked ferns are blanched and dried for use all year. The dried gosari is soaked and cooked in water. Before serving it's usually marinated and cooked with soy sauce, sesame oil and garlic. What does it taste like? Well, the seasonings certainly add strong flavors, but it's been described as tasting like a combination of asparagus, almonds and black kale. Another term is "earthy". A Korean meal typically features banchon, or little dishes of different foods, mostly vegetables or vegetable-based. Our restaurant lunch featured many of these. Pickled yellow radish is standard, as are different types of kimchi and other fermented vegetables. 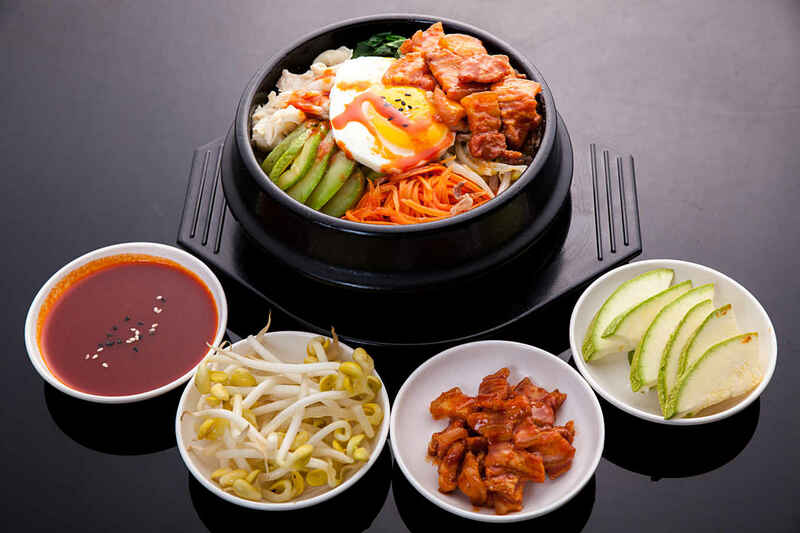 Many of the main dishes, notably the classic bibimbap, are filled with vegetables. Besides gosari, you will find plenty of familiar things like carrot, zucchini, spinach, scallions, cucumber, mushrooms, seaweed and bean sprouts. The main point: lots of vegetables. My friends noticed another interesting thing about the fresh fruit and certain vegetables - many are seasonal. When they're in season, you buy and eat them. Then they're gone until next year. "The fruit in Korea, particularly strawberries, apples, pears and persimmons is amazing. Strawberries are famous for their size and sweetness and are advertised on the sides of busses. Apples and pears were super expensive, like $2-$4 a piece, but they were enormous and were unbelievably good. Stumbling upon the persimmons was definitely a find. They are dried and are delicious!" Bibimbap (spelled Bee Beem Bhop the restaurant menu) is a popular choice at Korean restaurants, including at our lunch outing. According to HJ, it's traditionally served in an extremely hot stone bowl. Cooked rice is put on the bottom, seasoned, and topped with an arrangement of chopped pre-cooked vegetables and meat or fish (if using). The bowl is topped with an egg before serving, and the heat radiating from the stone bowl into the food cooks the egg. You can stir it all around to mix everything together, ensuring the egg is cooked. Because it's so hot, some of the rice may stick to the bowl, creating a crusty texture. In fact, everyone who ordered bibimbap agreed that the food was very hot. It was several minutes before they could start eating. Korean BBQ is a different concept from the American-style of BBQ, with meats slow cooked with smoke over wood or charcoal. The BBQ meat may be cooked at your table, similar to hibachi restaurants. It's thin-sliced and cooked quickly, served with Korean-flavored sauces, which can be heavy on the red chili and garlic. According to Ron and Linda, the foods were more salty/sour flavor, rather than bright/citrusy. I agree; the sauce on the pork I tried at the restaurant had a heavier, deeper flavor than what I'd expect from American/Southern BBQ sauce. Rice is a mainstay of the diet in Korea, and it's not just white rice. There are several varieties, mostly short grain, in different colors, ranging from white to black. There is no bread, in the Western/European sense, although there are noodles and pancakes. But these are savory pancakes that may contain vegetables, kimchi, tofu, jalapenos and even fish. In fact, we had fish pancakes as an appetizer at lunch, and we all agreed they were delicious. Tropezienne, which are a sort of sandwich cookie made with brioche dough and cream filling. While the main dishes and sides featured Korean flavors, the desserts were European/American, probably because dessert is not typically a feature of Korean meals. According to Ron and Linda, dessert is uncommon, but there are bakeries and ice cream shops. Bakery products were much less sweet than what Americans are used to, sometimes with strange ingredients. A pastry with a hot dog baked inside? Calcium intake is likely lower than recommendations in Western countries. Plant-based diets are known to be associated with better health and easier weight management. Which helps explain why South Korea has one of the lowest obesity rates in the world. Roughly 1/3 of Koreans are overweight/obese, which is half the rate in the US. HJ, Linda and Ron agree that there are far fewer obese people in Korea compared to the US. HJ attributes this to a diet rich in vegetables. "Over time, we really enjoyed Korean food. Once you get past barbeque as a kind of business celebratory meal, there are so many other foods that are really more interesting. A few examples were grilled mackerel, shabu-shabu (a meat/vegetable hot pot dish) and whole chicken stuffed with rice and poached. We really liked kimbap (gimbap), which is rice, tuna or salmon, mayonnaise, cucumber and some other things, rolled in dried seaweed. Yum!" Those rolls do sound delicious. My ideal healthy Korean meal would be bibimbap accompanied by samples of kimchi and vegetables, followed by a fresh in-season strawberry or a dried persimmon. I look forward to trying more Korean foods soon.